Yo creo que es un color que podemos utilizar sin miedo en los accesorios o textiles, puede dar un toque divertido y fresco a la estancia que hayamos decidido. A continuación os dejo una selección de fotografías tomadas de Pinterest, una de mis plataformas favoritas a la hora de buscar ideas e inspiración para todo. 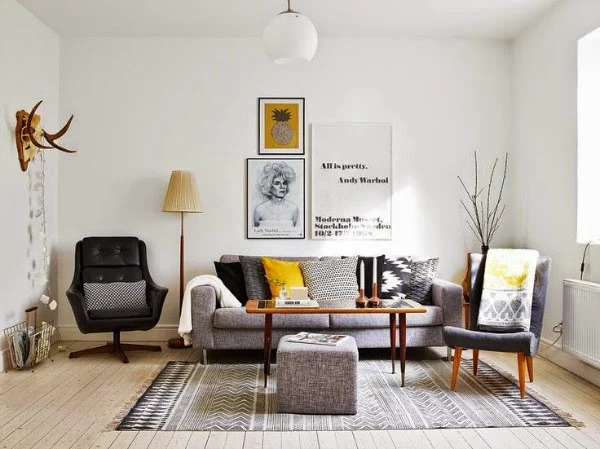 Si tenías dudas sobre cómo combinar un sofá amarillo, una cómoda o un cojín, sin duda alguna ahora te resultará mas fácil y te lo pensarás dos veces a la hora de elegir el color en la tienda. Muchas gracias por vuestros comentarios y visitas, ¡feliz semana! If there is a color that is trend in decoration, is the yellow. Hated by some and loved by others, you would be surprised to know that the yellow color brings feeling of spaciousness and light and can also combine it with other colors like white, black, gray, earth tones, but also complemented with blue or green, yes, for more daring people. I think it is a color that can be used without fear in textile and accessories, can give a fun and fresh touch to the room we have decided. Then I leave a selection of photographs taken from Pinterest, one of my favorite platforms when looking for ideas and inspiration for all. If you had doubts about how to combine a yellow sofa, dresser or cushion, no doubt you will find it easier now. Thank you very much for your comments and views, nice week!